This lyric dates from a memorable day in July 1774 when Goethe, accompanied by a group of friends including the famous Swiss pastor and scientist Lavater, took a trip from Ems down the Lahn towards the Rhine. Goethe improvised the poem on board and dictated it to Lavater as they passed the dramatically situated ruins of Castle Lahneck on the way to Coblenz. 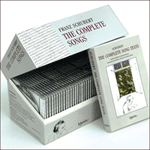 What cost the poet very little trouble to write seems to have caused the composer a great deal of trouble to set to music, judging by the number of versions in his hand – six in all which share the same Deutsch number. Four of these are printed in the old Gesamtausgabe, while the Neue Schubert Ausgabe has uncovered two more. It is always possible that the song was a hit among the composer's friends, and that the various versions in his hand which differ only in unimportant details were not re-thinks but copies made by memory for practical use. The first two versions which date either from 1815 or March/April 1816 are almost identical. They both start in E flat, with the second section – the voice of the ghost – in G flat ('mit Majestät'). 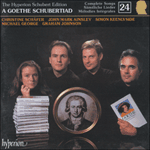 It was the second version which was sent to Goethe as part of the Lieder album of 1816. The third version (1818 according to Reed) is the only one written in the bass clef and in the keys of D and F major. It is an arrangement made at Zelisz in Hungary for Count Esterhazy who was a bass, and it is recorded here by a bass. Apart from the transposition of a semitone downwards surprisingly little has changed in the composer's reaction to the text in the two years since it was first written. The fourth version reverts to E flat; certain chords are arpeggiated and the vocal line is ornamented twice. This version and its date seem to point to the influence of Schubert's baritone Johann Michael Vogl (the bass version in D would have been a trifle too low for him). The fifth version has the direction 'Kraftvoll' ('With strength'); tiny details and note values have been changed, but it is difficult to see why. The sixth and final version is substantially different, at least on the first page. It was published in the last months of the composer's life and it is clear that he went in for a wholesale revision of the first section at the same time as essentially conserving the shape and skeleton of the piece from the old times – highly appropriate when one considers the subject-matter of the song. The key is recast into E major and what has been recitative in all the other versions is now a slow measured tune which differs rhythmically rather than melodically from the earlier songs. This ineffably peaceful unfolding of melody with a completely new tremolando accompaniment is reminiscent of the ethereal opening of the violin Fantaisie D934; this type of shimmering and shuddering pianistic effect was also to be used in certain passages in the Heine settings – Am Meer and Der Atlas from Schwanengesang. At last Schubert has found the ghostly atmosphere for the opening that had hitherto eluded him. The second section (here marked 'Stark, im ersten Zeitmasse' — 'Strongly, in the first tempo') is completely unchanged from earlier versions apart from the fact that it is a semitone higher than most of them. One can see why Schubert retained the setting of 'Mein halbes Leben stürmt' ich fort' (strong activity suggested by the dotted rhythms, followed by the more languid antithesis of 'verdehnt' die Hälft' in Ruh'): it is not only a symmetrical melodic rising and falling curve, but the perfect realisation of the meaning of the words. The soft repetitions of 'Du' bring Wandrers Nachtlied II vividly to mind. The whole song creates a similar mood of inscrutable grandeur as man communes with nature. Es wohl zu fahren heisst. he bids it a safe voyage.